Some of those chapters, like Access-Lists, Sflow, and QoS got cut because they’re pretty generic and I felt that they were easily learned from the EOS manual. I also felt that they didn’t really contribute to how Arista is different, so I removed them in favor of the new chapters. 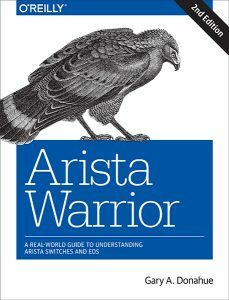 If you’d like to read about these topics, the first edition of Arista Warrior is always available in soft copy format from O’Reilly. Configuration Management: Config sessions, config replace, etc. Thanks to everyone who’s helped along the way, and to those who did, make sure to look for your names as a thank you in the preface of Arista Warrior, Second Edition!